I have a felting machine which will produce sheets of felt up to 1200mm x 600mm. Fleece from Corriedale sheep is ideally suited for this purpose. I can supply these sheets to customers but I also produce handcrafted bags, rugs and wall hangings with my own needlefelted designs or to the customers requirements. 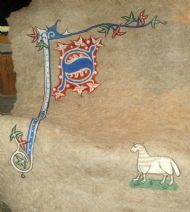 At present I am working on decorated initials based on medieval manuscripts and illustrations. 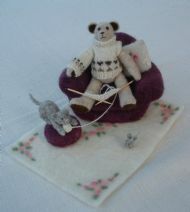 I also make a range of miniature needlefelted animals including tiny teddy bears. 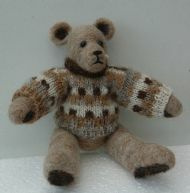 These bears are often wearing individually designed fairisle pullovers, hand knitted from my own handspun wool. Some of my animals are available as fridge magnets or brooches.